Dry food / pellets for Guinea Pigs - handle with care! [Auto translated] To feed Guinea Pigs with dry food / pellets or to do not is always a bone of contention. Why? In fact this pellets belongs to industrial fattening rabbits and has never been a healthy food for pets such like Guinea Pigs. You’re doing your best if you provide it rarely only like sweets for your child’s and should not be part of its diet. Lets draw a bigger picture: If you take notice about that this food has been created to industrial fattening rabbits you might not ask yourself weather if this is a good food option for your Guinea Pigs or not. But truly and sadly feeding cavies with pellets is recommended often in the internet, by pet shops or in books. And it has never been a good idea to feed them with that kind of junk exclusive. This stress-free and comfortable way of feeding is comfortable for you only and may cause many of diseases at the long end. Please take a few minutes to get clear what feeding Guinea Pigs with pellets might cause. It is an typical urban legend that dry food such like pellets is good for dental healthy of your cavies. In fact the opposite is true. Guinea Pigs has continually growing teeth that needs to be abraded. Pellets can’t to the job because cavies only bites the pellets and swallow it. They do not chewing dry food and their teeth will not be abraded. Due to its hardness there is always a risk that a tooth can break by chewing a pellet. It is also important to know that pellets does not contain much water (< 17%) and most cavies does not compensate it by drinking more water. Their water balance becomes unbalanced and their gut microflora gets in trouble. Bladder stones are another result. Dry food does not prevent malocclusion. It favored malocclusion! Dry food may cause dehydration which causes bladder stones and much more! Molasses is a fall-out of the industrial production of white sugar. A pellet is pressed hay (most likely) glued with molasses. There are quite a half million tons uses for animal food production each year. 70% of molasses is carbohydrate and it is rich in saccharose. This favored coliform bacteria – especially the Escherichia coli (e. coli) and irritates the enterobacteria. This causes diarrhea and might be the death of your Guinea Pig. Feeding your ill cavy continuous with dry food (molasses) impairs too. Dry food is not healthy! Vitamin K3 is a deception. Vitamins are always a strong argument to promote food. Manufacturers of pet food has already recognized that zoo keeper always try to do their best and wan’t to provide their pet only the healthiest and tastiest food. And of course it is a platitude that vitamins are essential for healthy. But there is a problem. Menadione is not really a vitamin. It is only labeled as it. And sadly it is toxic for Guinea Pigs. In industrial fattening this might not really be a problem because the animals will be slaughtered before they get problems and run in trouble. But we all do our really best for a longlife of our pets, right? So leave the pellets in the pet-shop if it contains the vitamin K3. There is another problem: In most countries the manufacturers are not legally obligated to make a declaration of menadione. If you are unsure – leaving it untouched is the best you can do! Dry food is not rich in vitamins. And if it is rich in vitamin K3 it is not healthy. 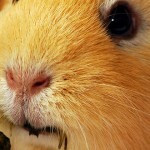 Look how pet shops feed Guinea Pigs and you’ll get the answer how to feed them at lowest costs. The answer is: Dry food / pellets. But feeding with lowest costs is the worst strategy if you wan’t to keep them healthy and avoid diseases as long and best as possible. You pay the price for the low-cost feeding in the pet shop. Be smart and do not impair the problem by feeding your Guinea Pigs with pellets too. The care of your veterinarian (may be in later years) will be much higher and you get the bill for your comfort. If you get a cavy from a pet shop its accustomed in pellets you need provide it too but downsize the amount each day a little bit to zero so the cavy can get accustomed to fresh hay and fresh food. Take care about the ingredients of your dry food / pellets. Pet Shops tells you how to not feed Guinea Pigs. If you decide to provide pellets please take ones without grain (such like sunchoke pellets) and with dried vegetables and herbs. Pellets swell and cause a faster feeling of satiety. 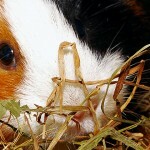 This causes that the cavies does not eat enough hay to abrade their teeth. So please provide it rarely and in short amounts. Only feed at max 1 teaspoon of dry food / pellets per cavy each day. Pellets has to be handled like candy and should never replace regular food. Dry food does not really contain any valuable ingredients. Overweight which cause lack of exercise. Favored fatty degeneration / metamorphosis of liver. Pregnant cavies often dies of that. Dysfunction of bowel which may cause death. Starch will be transformed to sugar and results in yeast / barm in fermentation process. Bowels will blown up and cause stomach ache. Your cavies dehydrate. They naturally does not drink as much as the pellets necessitate it. Dental problems. The pellets will be swallowed and swell up. This cause saturation so they don’t eat enough hay to abrade their teeth accurate. There are studies that 1 teaspoon of pellets reduce 30% of hay. Pellets and other dry food, well known simply as “Guinea Pig food” or “cavy food” might be anything but never a real option to feed your pets healthy. It is quite simple a product of industrial fall-out. A junk food filled in colorful packages with almost superlative advertising. As customer it is quite difficult to distinguish bad food from good food. In case of doubt leaving it untouched is the best you can do for your Guinea Pigs. They really don’t need any of these products. It is always a human opinion to feed them with it. If you’d like to feed your cavies like your cavies would answer if you could ask them, take a look at our Guinea Pig food list. This is not more expensive than using the junk food but you take care and your Guinea Pigs will thank you for that! Thank you so much for taking the time to share such important information with us. 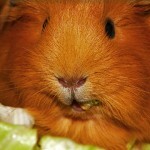 My guinea’s are my babies and this article has helped tremendously. Both myself and, trust me, my babies thank you.